The terminal is designed for discharging cement from ocean going vessels, conveying it to a rebuilt flat storage building and back to the jetty barge, to load river barges or to convey the cement to silos for loading trucks. 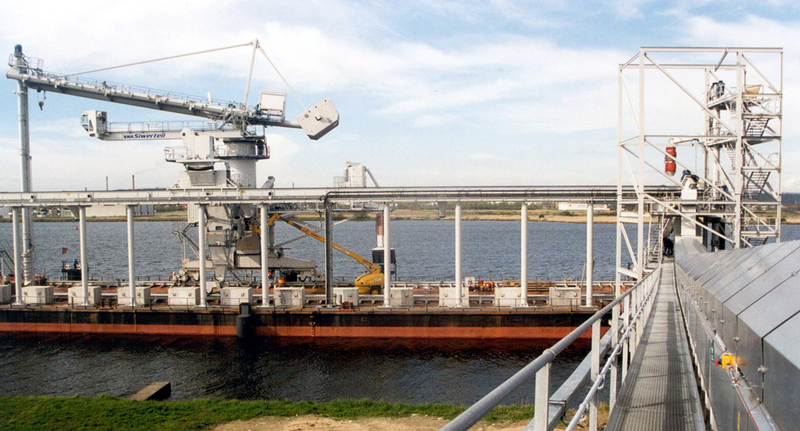 Cement is conveyed from the jetty barge by a horizontal screw conveyor and a belt conveyor to the horizontal screw conveyors in the flat storage building. Total storage capacity of the terminal is about 25,000t, and it’s designed to use the same conveyors for unloading and loading, by having the horizontal screw conveyors and the belt conveyor to transport cement in both directions. This as well as other functions are controlled by an advanced PC based control system. For the bulk truck loading an automatic PC based weighing system is installed. 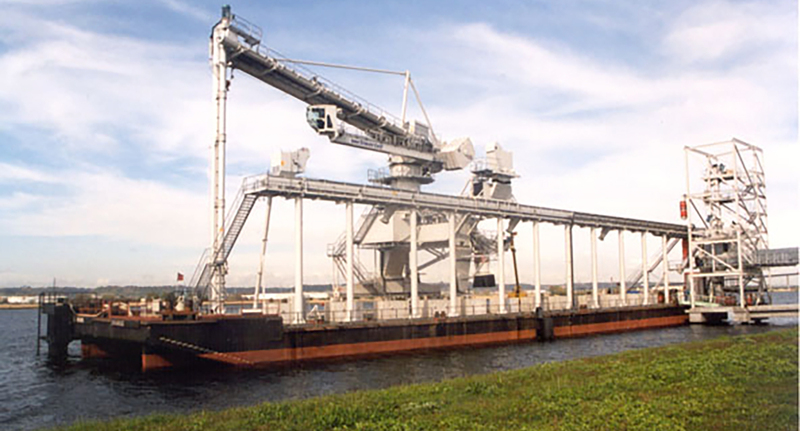 • Design, manufacturing, delivery and installation of ship unloader, combined with loading possibility for barges. The heavy steel structure of the unloader is used to carry also the loader. • Design, manufacturing, delivery and installation of shore conveying and dispatch equipment. • Design delivery and installation of electrical distribution, PLC and PC control system. Ship size / unloading cap. Loader model / loading cap. Barge size / loading cap. Distribution of cement to flat storage with horizontal screw conveyor. Dispatch from flat storage to silos with vertical screw conveyors for truck loading or for loading to barges.